remember, it’s you who drove us. journey. As #GrabTurns5, let’s revisit some of those moments in the video clip below. that’s inspired by real stories. And here’s that surprise gift. It’s our 5th anniversary and we’d like to thank you for being part of the awesome 5 years! Book a GrabCar from June 5 to 14 and you might just get Grab vouchers if our Surprise Anniversary Cars come to pick you up! Only available in Manila. with a P50 tip from us. Please join us in thanking our drivers by giving them a P50 tip – on us! 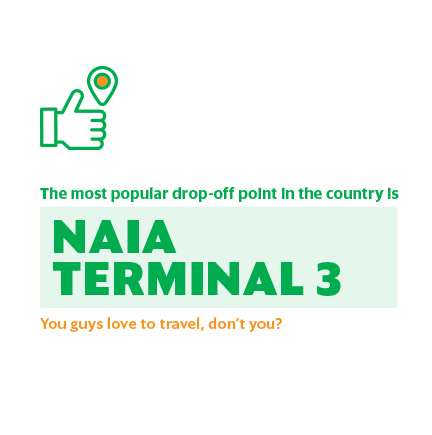 Show the love from June 11 to 14 and key in the promo code 5THANNIV to help make a Grab driver happy. Only applicable in Manila. Terms and Conditions apply. The year it all happened. Launched MyTeksi in Malaysia (before we were known as Grab) with only 40 taxi drivers! To date, we have over 930,000 drivers across the region. Yes, we’ve come a long way. To make affordable transportation more accessible, we introduced GrabCar, and GrabBike in some countries. That didn’t just mean more ride options for everyone, it created more job opportunities too. In December of 2015, Grab announced its partnership with the World Bank Group to develop Open Traffic, a non-profit global data platform that can help governments improve traffic conditions. Pretty cool, right? GrabShare came into the picture. Together with our other carpooling product, GrabHitch, we’ve removed an estimated 16,000 cars off the road. As a result, we’ve helped cut carbon emissions by 3,166,353kg. See, sharing is caring for the environment. In the same year, GrabPay was launched too, making your rides more seamless with local cashless payment preferences. Grab is now in 7 countries, including Myanmar recently, servicing 55 cities across Southeast Asia. Huge thanks to everyone of you for this amazing growth. Choose GrabCar (Sedan) as the vehicle type. Choose your pick up and drop off location. If the Grab 5 th Anniversary Surprise Cars pick you up, you automatically get a Php 100 Grab voucher. The Promotion will run from 5 June 2017 to 14 June 2017 (the “Promotion Period”). To participate, participants are required during the Promotion Period to book a GrabCar ride via the Grab app. The allocation of Anniversary Cars to bookings are at random. As there are a limited number of Anniversary Cars, there is no guarantee that everyone will be able to get allocated an Anniversary Car during the Promotion Period. The Prize offered in the Anniversary Car cannot be exchanged for cash or other products. Grab reserves the right to change the terms of conditions at any point of time. The Promotion can be suspended or cancelled at any point in time without prior notice. Spot the Grab 5th Anniversary Car roaming around your city and snap a photo. Upload the photo on Facebook or Instagram, tell us about your best Grab experience and use the hashtags #GrabSnapandShare and #GrabTurns5. The best stories in each city will win Php 500 worth of Grab rides. The Promotion will run from 6 June 2017 to 14 June 2017 (the “Promotion Period”). To participate, participants are required to follow the mechanics of the Promotion. The Prize offered for the Snap and Share contest cannot be exchanged for cash or other products. The Prize for each city will vary according to the available services in the city.